Top-Panel: RGB image created using the information in the CALIFA datacubes, for five different images (red = 6900 Å , green = 5250 Å ,blue = 4100 Å). Bottom-Panel: Animated image showing different dataproducts derived from the datacubes: Luminosity weighted stellar age, Stellar mass, H-alpha intensity map, H-alpha velocity map and Stellar velocity map. The Calar Alto Legacy Integral Field Area survey is one of the largest IFS surveys performed to date. At its completion it will comprise 600 galaxies, observed with the PMAS spectrograph in the PPAK mode, covering the full spatial extent of these galaxies out to at least two effective radii. The wavelength range between 3700 and 7500 Å is sampled with two spectroscopic configurations, a high resolution mode (V1200, R~1700, 3700-4200 Å), and a low resolution mode (V500, R~850, 3750-7500 Å). A detailed explanation of the survey is given in the CALIFA Presentation Article (Sánchez et al. 2012). The second CALIFA Data Release (DR2) provides to the public the fully reduced and quality control tested datacubes of 200 objects in both setups (V500 and V1200). Each datacube contains ~1000 independent spectra, thus in total this DR comprises ~400,000 total independent spectra (~1.5 millon after cube reconstruction). The details of the data included in this DR are described in the CALIFA DR2 Article (García Benito et al. 2014). The differences in the data reduction pipeline adopted for this dataset are described in this article too, in comparison with the current solution adopted for DR1 (Husemann et al. 2013). The complete list of the DR2 objects for which we deliver data can be found in the following webpage. The main characteristics of the galaxies included in the full CALIFA mother sample, a subset of which are delivered in this DR, is given in the CALIFA sample characterization article (Walcher et al. 2014). 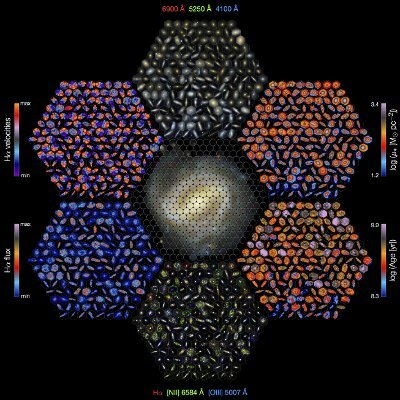 This article provides detailed information of the photometric, morphological and environmental properties of the galaxies, and a description of the statistical properties of the full sample. The full tables comprising all this relevant information are also delivered together with the DR2 datacubes thought the sample characterization webpage. DR2: List of Objects included in this Data Release. DR2: Search tool to select particular objects (using Java-Applets). Alternative Search tool for Mac users and/or with Java-Applet problems (Java version below 1.7). Garcia Benito et al. 2014: DR2 Article. Walcher et al. in prep: CALIFA Sample Characterization Article. 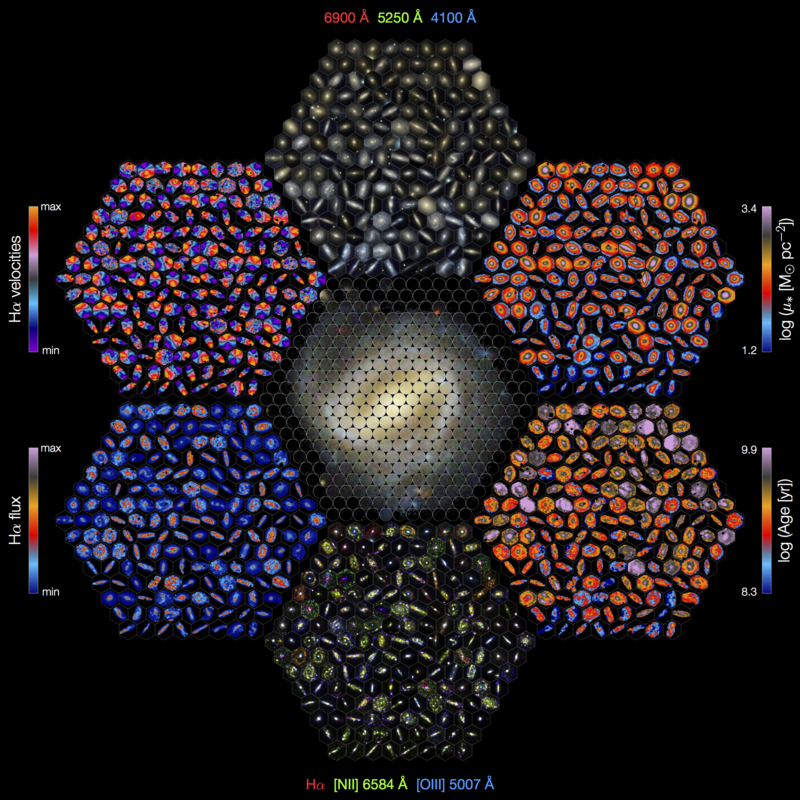 Several of the main properties observable in 2D are highlighted for 169 randomly-selected galaxies, shown individually in hexagons that together form the shape of a CALIFA-like FoV. The galaxies have been ordered by r-band absolute magnitude (a proxy for the stellar mass), from top right (lowest absolute magnitude) to bottom left (highest absolute magnitude). The highlighted properties derive from several different analysis pipelines developed within the collaboration. Stellar properties like ages and mass surface density were measured with the starlight code (Cid Fernandes et al. 2013) while gas properties and emission lines were measured using FIT3D (Sánchez et al. 2007). This plot is only intended to demonstrate the diversity of the DR2 sample.